Among top sellers at the Wyoming State Museum’s store in Cheyenne is one product you might not expect: a chili seasoning. Chugwater Chili sells a zesty complement to cuisine that has won devoted fans across the country. 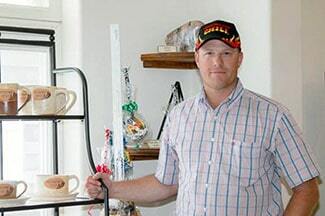 Chugwater Chili was found in 1986 at Chugwater, an eastern Wyoming town of about 200 people. But over the years, the fame of Chugwater Chili’s signature seasoning has much exceeded the company’s sparsely populated location, as comments on its website from fans across the country suggest. That great flavor has more than a passing connection with the state of New Mexico. Chili peppers for the seasoning are grown around Hatch, N.M., and then blended at a plant in Colorado. Packaging, shipping, and marketing are done by the company staff in Chugwater. 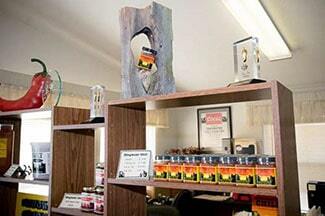 In addition to its signature chili seasoning, Chugwater Chili sells chili dip and dressing mix, red pepper jelly, a steak rub, and chili nuts. Karen Guidice has been involved with the company for several years. 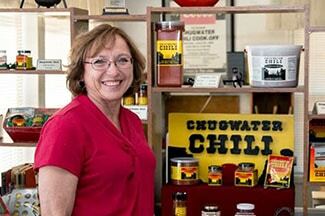 In 2015, following a spate of changes within the company, Karen and her business partner Justin Gentle decided to purchase Chugwater Chili. They hope to increase regional markets for the products, including in grocery stores, and then expand more broadly – first nationally, and then perhaps globally. In charting a course to achieve their goals, Karen contacted the Wyoming Small Business Development Center Network for advice. John Privette, SBDC’s regional director for Goshen and Laramie counties, and his colleagues helped Karen and Justin develop pricing models for wholesale distribution and Facebook strategies. 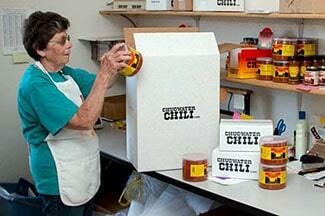 In conjunction with Manufacturing-Works, SBDC also helped evaluate Chugwater Chili’s products for export readiness. Click on the “success stories” to the right to learn how other Wyoming businesses have achieved success in the Cowboy State.